Tetrameric peptide-MHC class I complexes (“tetramers”) are proving invaluable as reagents for characterizing immune responses involving CTLs. However, because the TCR can exhibit a degree of promiscuity for binding peptide-MHC class I ligands, there is potential for cross-reactivity. Recent reports showing that the TCR/peptide-MHC interaction is dramatically dependent upon temperature led us to investigate the effects of incubation temperature on tetramer staining. We find that tetramers rapidly stain CTLs with high intensity at 37°C. We examine the fine specificity of tetramer staining using a well-characterized set of natural epitope variants. Peptide variants that elicit little or no functional cellular response from CTLs can stain these cells at 4°C but not at 37°C when incorporated into tetramers. These results suggest that some studies reporting tetramer incubations at 4°C could detect cross-reactive populations of CTLs with minimal avidity for the tetramer peptide, especially in the tetramer-low population. For identifying specific CTLs among polyclonal cell populations such as PBLs, incubation with tetramers at 37°C improves the staining intensity of specific CTLs, resulting in improved separation of tetramer-high CD8+ cells. Confocal microscopy reveals that tetramers incubated at 37°C can be rapidly internalized by specific CTLs into vesicles that overlap with the early endocytic compartment. This TCR-specific internalization suggests that coupling of tetramers or analogues with toxins, which are activated only after receptor internalization, may create immunotoxins capable of killing CTLs of single specificities. Tetrameric arrays of soluble peptide-MHC class I complexes (“tetramers”) bind to CTLs sufficiently well to allow the labeling of CTLs according to their antigenic specificity. Fluorogenic tetramers have already been widely used for the characterization of CTL responses (1, 2, 3, 4, 5, 6, 7, 8, 9, 10, 11, 12, 13, 14, 15, 16, 17, 18, 19) and have afforded many advantages over previous techniques, particularly the ability to directly quantify and phenotype Ag-specific CTLs ex vivo. It is well documented that the TCR can exhibit a degree of promiscuity for peptide-MHC class I ligands (20, 21, 22). It has also been suggested that the enhanced avidity afforded by multimerization of peptide-MHC may allow binding to TCRs with affinities that are too low to ever generate ligand-induced physiological responses (23). In this study, we use MHC class I tetrameric complexes incorporating natural HIV-1-altered peptide ligands (APLs)4 to investigate this possibility. Because the binding between monomeric complexes and the TCR is very weak, it had been assumed that tetrameric complexes also bind weakly to CTLs, and tetramer incubations have usually been conducted at 4°C to increase the stability of binding (1). Our findings reveal a temperature-dependent cross-reactivity between tetramers and low-avidity CTLs that may be relevant in the interpretation of studies using tetramers. In addition, we find that tetramers stain CTLs very rapidly and with higher intensity at 37°C than at 4°C; furthermore, we demonstrate that tetramers can be specifically internalized by CTLs. CTLs were derived and maintained as described previously (5, 24). PBLs that had been cryopreserved were cultured for ≥2 h after thawing before staining with tetramers. Cytolytic activity was determined using standard 51Cr release protocols (25). Peptides were synthesized by standard fluorenylmethoxycarbonyl chemistry and subsequently used in chromium release assays and in synthesis of tetramers. The peptides used, referred to subsequently in the text by their first three letters only, included: SLYNTVATL, an HLA-A2.1-restricted epitope from the HIV p17 gag matrix protein, and its naturally occurring variants SLHNTVATL, SLSNTVATL, SLFNTVATL, SLFNAVATL, and SLNYTIAVL (24, 26, 27); ILKEPVHGV, an HLA-A2.1-restricted epitope from the HIV pol protein (2); GLCTLVAML, an HLA-A2.1 epitope from the BMLF1 protein of EBV; and GILGFVFTL, an HLA-2.1-restricted epitope from the influenza matrix protein (IMP) (6). Tetrameric peptide-MHC class I complexes were made as described previously (1, 2). Briefly, recombinant β2-microglobulin and the extracellular portion of the MHC class I heavy chain containing the BirA recognition sequence in frame at its C terminus were expressed in Escherichia coli as insoluble aggregates that formed inclusion bodies. Purified inclusion bodies were solubilized in urea, and monomeric HLA class I complexes were refolded around peptide by dilution of denaturing conditions. After buffer exchange, a specific lysine residue in the heavy chain C-terminal tag was biotinylated with BirA enzyme. Monomeric complexes were purified by gel filtration and anion exchange chromatography. Tetrameric arrays of biotinylated peptide-MHC class I complexes were formed by the addition of PE- or FITC-labeled avidin (extravidin, Sigma, St. Louis, MO). Tetramers are referred to by the first three letters of their peptide (e.g., GIL for the HLA-A2.1 GILGFVFTL tetramer). CTL clones and lines were washed in tissue culture medium and incubated with PE-labeled tetramers (0.1 mg/ml of monomer) at 4°C, 23°C, or 37°C for the times indicated, along with TriColor anti-human CD8 (Caltag, Burlingame, CA) when cells were double-stained. For comparisons between PBL staining protocols, cells were washed in tissue culture medium before incubation with tetramers for 15 min or 60 min at 4°C or 37°C and subsequently washed at either 4°C or 37°C before incubation with TriColor anti-CD8 for 15 min on ice. All cells were washed twice after staining with ≥2 ml PBS/FCS 1% before fixation in 1% formaldehyde. Stained cells were analyzed by FACS (Becton Dickinson, Mountain View, CA) using CellQuest software. Cloned human CTLs specific for the HLA-A2.1-restricted IMP epitope were incubated with FITC-labeled GIL tetramer for 15 min at 37°C and subsequently adhered to glass slides coated with 50 mg/ml poly-l-lysine (Sigma) and fixed with methanol for 5 min. Some slides were stained for 30 min with monoclonal mouse OKT9 (anti-transferrin receptor Ab), washed three times in PBS/FCS 1%, and incubated with Texas Red-conjugated goat anti-mouse sera (Jackson, West Grove, PA) (diluted 1/100 in PBS/BSA 1% for 30 min). All slides were then washed three times as described previously and a mounted on a coverslip with PBS/glycerol 90% containing 2.5% 1,4-diazabicyclo[2,2,2]octane (Fluka, Buchs, Switzerland). Cell staining was examined with an MRC-1024 confocal microscope (Bio-Rad, Richmond, CA). The majority of HLA-A*0201 HIV-1-infected patients mount a CTL response to an immunodominant epitope (SLYNTVATL) encoded in the p17 gag matrix protein (27). We have documented naturally occurring mutations within this epitope that can lead to escape from, or altered recognition by, patient CTLs (24, 27, 28, 29). CTL clones 003 and 5D8 and a CTL line from patient 868 show different patterns of recognition of naturally occurring SLYNTVATL variants (Figs. 1⇓-3), consistent with their different origins and TCRs (our unpublished data and Ref. 13). We used these CTL and HLA-A2 tetramers folded around wild-type and variant peptides to examine the specificity of direct CTL visualization in vitro. 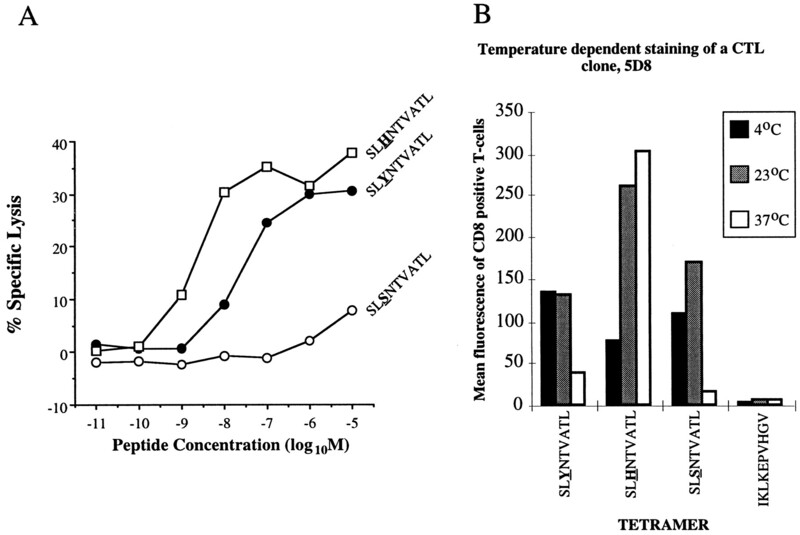 The effect of temperature on the staining of CTL clone 003 by tetramers incorporating peptide variants. The cytotoxicity and tetramer staining of CTL clone 003 specific for the HLA-A2.1-restricted HIV epitope SLYNTVATL were assessed. A, Specific lysis of HLA-A2.1-matched targets pulsed with 10-fold dilutions of variant peptides at an E:T ratio of 3:1. Data points represent the mean of three replicates. B, Temperature dependence of staining with tetramers folded around SLYNTVATL variant peptides and the A2 HIV-1 reverse transcriptase peptide ILKEPVHGV (ILK). Staining is expressed as mean fluorescence for a homogeneous cell population and is an average of three experiments. C, Histogram plots of mean fluorescence intensity (MFI) for SLY and SLH variant tetramer staining at 4°C, 23°C, and 37°C. APLs, which act as weak agonist or antagonist ligands, have a lower affinity for the TCR (reviewed in Ref. 20), while they can bind to MHC with similar affinities (24). Tetramers of poorly recognized APLs can stain CTLs at 4°C (see SLH in Fig. 1⇑, SLS in Fig. 2⇓, and SLF in Fig. 3⇓). Surprisingly, APL-MHC tetramers of ligands that do not stimulate CTL-mediated lysis, such as the SLH variant with 868 CTL, can also stain CTLs efficiently at 4°C (Fig. 3⇓). We were unable to demonstrate antagonism of these CTLs with the SLH variant. None of these A2 gag CTLs were observed to stain with A2 tetramers of the unrelated epitopes ILKEPVHGV ( Figs. 1–3⇑⇓⇓), GILGFVFTL, or GLCTLVAML (data not shown). The effect of temperature on the staining of CTL clone 5D8 by tetramers incorporating peptide variants. The cytotoxicity and tetramer staining of CTL clone 5D8 specific for the HLA-A2.1-restricted HIV epitope SLYNTVATL were assessed. A, Specific lysis of HLA-A2.1-matched targets pulsed with 10-fold dilutions of variant peptides at an E:T ratio of 3:1. Data points represent the mean of three replicates. B, Temperature dependence of staining with tetramers folded around variant peptides. Staining is expressed as mean fluorescence for a homogeneous cell population and is an average of two experiments. The effect of temperature on the staining of polyclonal CTL line 868 by tetramers incorporating peptide variants. The cytotoxicity and tetramer staining of polyclonal CTL line 868 specific for the HLA-A2.1-restricted HIV epitope SLYNTVATL were assessed. A, Specific lysis of HLA-A2.1-matched targets pulsed with 10-fold dilutions of variant peptides at an E:T ratio of 3:1. Data points represent the mean of three replicates. B, Temperature dependence of staining with tetramers folded around variant peptides. Staining with tetramer containing an HLA-A2.1-restricted epitope from HIV-1 reverse transcriptase (ILKEPVHGV) is shown for comparison. Staining is expressed as the percentage of CD8+ lymphocytes visualized with tetramer for a heterogeneous cell population. C, Density plots for SLY and SLH variant tetramer staining at 4°C, 23°C, and 37°C. The binding of TCRs to their peptide-MHC ligands at 25°C is characterized by low affinity, slow kinetics, and a high degree of cross-reactivity (20). The dramatic increase in binding kinetics with temperature (30) prompted us to investigate the effect of temperature on the ability of peptide-MHC tetramers to form stable complexes with cell surface TCR. At 4°C, both CTL clones stained with tetramers containing SLYNTVATL variant peptides that they recognized only weakly in chromium release (see variant SLH in Fig. 1⇑ and SLS in Fig. 2⇑). 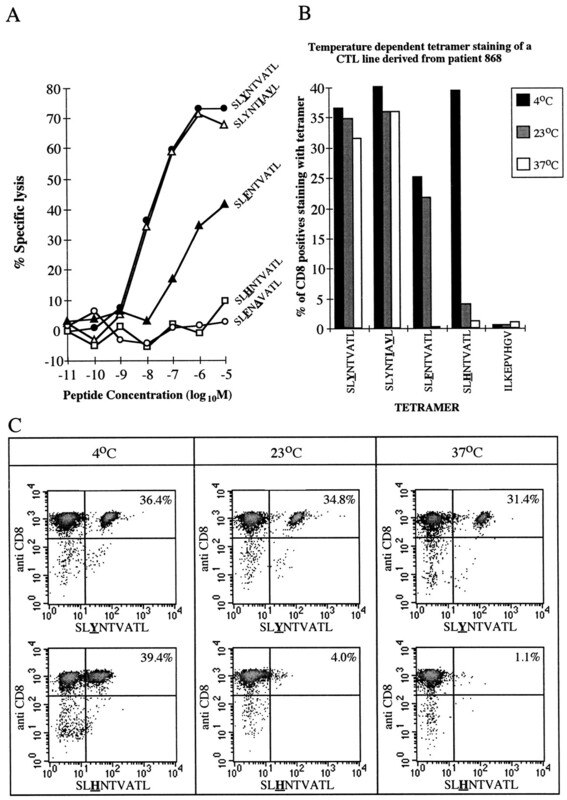 For both clones, increasing the incubation temperature to 37°C reduced the staining by tetramers incorporating weakly recognized peptide variants without a reduction in the strong staining by tetramers incorporating strongly recognized peptide variants (Fig. 1⇑, B–C, and Fig. 2⇑B). The hierarchy of staining with peptide variant tetramers at 37°C reflected the hierarchy of recognition of each of the variant peptides in the chromium release assay (e.g., for the CTL clone 5D8 both tetramer staining and chromium release show the hierarchy SLH > SLY > SLS (Fig. 2⇑)). Staining with variant tetramers at 4°C did not correlate with recognition of variant peptides in the chromium release assay for either clone. The potential effect of this phenomenon on the staining of biological samples is seen with a polyclonal CTL line from patient 868 that also recognizes SLYNTVATL peptide variants to different degrees (Fig. 3⇑). This polyclonal line contains ∼33% of SLYNTVATL-specific CTLs, as seen by staining with the SLY tetramer (Fig. 3⇑B). When incubated at 4°C, tetramers made from the SLH variant peptide, which does not stimulate CTL-mediated lysis, stain a population of similar size (Fig. 3⇑B). Increasing the temperature of the tetramer incubation reduces the proportion of this line that stains with the SLH tetramer, so that at 37°C, there is no staining with this unrecognized peptide variant (Fig. 3⇑, B and C). The results for three different TCRs and several APLs in Figs. 1–3⇑⇑⇑ show that improvements in staining specificity for strongly recognized ligands with increasing temperature are neither TCR- nor APL-dependent. In addition to increased specificity for well-recognized peptide variants, staining at 37°C also increased staining intensity with strongly recognized ligands (see the SLY tetramer in Fig. 1⇑B and the SLH tetramer in Fig. 2⇑B). It is important to note that all SLYNTVATL variant tetramers used are sufficiently stable at 37°C to stain appropriate CTLs brightly ( Fig. 1–3⇑⇑⇑). 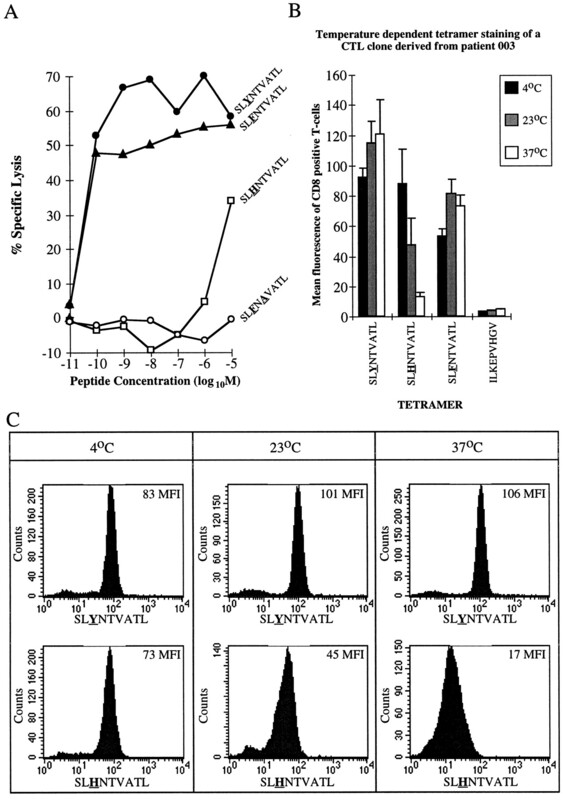 Hence where increasing temperature reduces tetramer staining, in the case of variant peptides that are poorly recognized by the CTLs, this is not due to tetramer instability at higher temperature (e.g., the SLF tetramer stains 003 CTLs brightly at 37°C but does not stain 868 CTLs at this temperature). 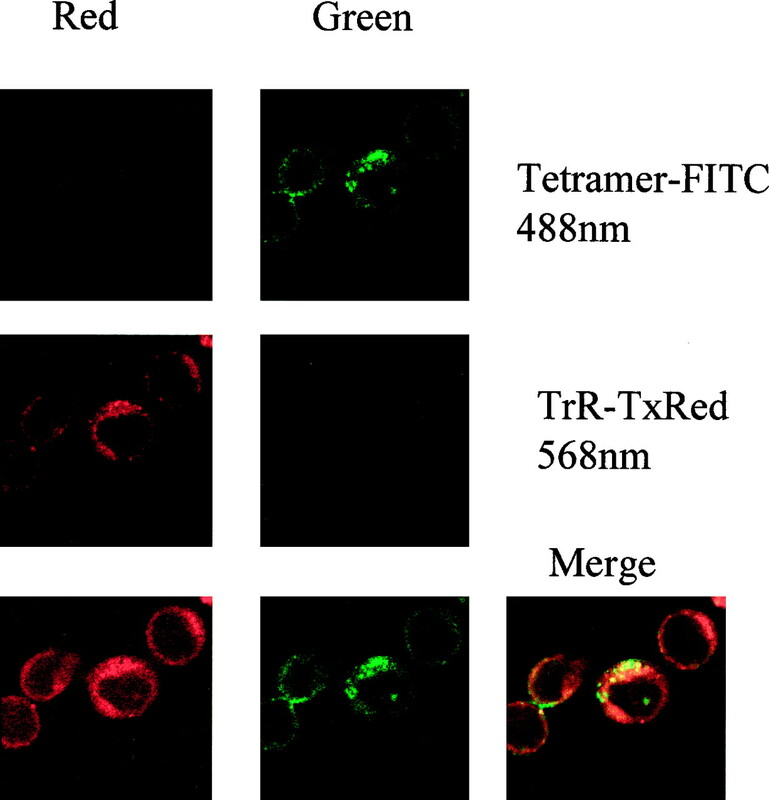 Preincubation of tetramers at 37°C for 60 min before staining CTLs also had no demonstrable effects on subsequent staining (data not shown), confirming the stability of the reagents under the experimental conditions employed. Incubation of the 003 CTL clone (Fig. 4⇓) and the 868 CTL line (data not shown) for between 0 min and 20 min at 37°C showed that staining was complete after 5 min and did not increase significantly with longer incubations. Staining occurred in minutes in the presence of 0.1% azide during staining (Fig. 4⇓) and was indistinguishable from staining without the inclusion of azide (data not shown). Time course of tetramer staining at 37°C. The kinetics of tetramer staining at 37°C was investigated by incubating CTL clone 003 with SLYNTVATL tetramer for various lengths of time (0.5, 5, 10, and 20 min). SLYNTVATL tetramer was not added to the “0 min” sample. The experiment was conducted in presence of 0.1% azide throughout. The rapid bright stable staining observed of CTLs at 37°C led us to examine whether tetramers were being internalized after interacting with the TCR. An IMP-specific CTL clone that stained in FACS analysis with GILGFVFTL tetramer but not with other HLA-A2 tetramers was incubated with this tetramer for 15 min at 37°C and examined by confocal microscopy, with and without double staining, to identify intracellular compartments. Tetramer was indeed internalized by this clone within 15 min at 37°C, and was visible in intracellular vesicles (Fig. 5⇓). These vesicles overlapped in distribution with vesicles containing the transferrin receptor, although not all of these early endosomes were labeled with tetramer. Internalized tetramer did not colocalize to secretory lysosomes containing perforin or granzyme B (data not shown). Incubation with tetramer for 15 min at 4°C did not induce detectable internalization of tetramer (data not shown). Tetramers incubated at 37°C are rapidly internalized by Ag-specific CTLs. A human CTL clone specific for the HLA-A2.1-restricted IMP epitope GILGFVFTL was incubated with FITC-labeled GILGFVFTL tetramer for 15 min at 37°C and subsequently fixed and subjected to confocal staining with and without Texas Red costaining for the transferrin receptor. The top four panels show that when excited with the 488-nm line, only the FITC signal is detected; likewise, when excited with the 568-nm line, only the Texas Red signal is detected, confirming lack of “bleed-through” between the channels. The bottom panels show excitation at 488 nm plus 568 nm, demonstrating overlap between the signals, indicating that endocytosed tetramer is reaching early endosomes that stain for transferrin receptor. Peptide-MHC class I tetramers are set to revolutionize the analysis of CTL responses and have already been used in a wide variety of pathological conditions. Tetramers have commonly revealed surprisingly high frequencies of Ag-specific CTLs compared with those estimated by previous techniques. This discrepancy is probably due in large part to the technical limitations imposed by other methods. The detection of specific CTLs by limiting dilution analysis, for example, requires high proliferative potential, which probably explains why the frequencies obtained are approximately one order of magnitude lower than those revealed by tetramers. Nevertheless, because it is well documented that the TCR can exhibit a degree of promiscuity for peptide-MHC class I ligands (20, 21, 22), there is significant potential for cross-reactivity in the identification of Ag-specific CTLs using tetramers. Peptide-MHC complexes need not bind with high affinity to trigger the TCR. A recent report shows that there is little correlation between the equilibrium binding affinity (Kd) of a ligand and its potency for T cell activation, and that the potency of a ligand correlates much better with its off-rate (31). Small changes in the sequence of an antigenic peptide (APL) can lead to slightly faster off-rates; relatively small changes in the off-rate can greatly affect the ability of a ligand to trigger T cells (32). To activate T cells, a single peptide-MHC needs to serially trigger multiple TCRs (33). Thus, strongly recognized ligands fall within a “kinetic window” representing a compromise between enough time to allow all the molecular steps required to trigger a TCR and a rapid enough dissociation from the triggered TCR to make it available for further cycles of binding and triggering (32). Assuming a fast enough on-rate, the ability of peptide-MHC class I tetramers to stain CTLs for FACScan analysis will be exclusively dependent upon a sufficiently slow off-rate. Our data demonstrate that the dramatic temperature dependence of the TCR/peptide-MHC interaction (30, 34) can be exploited to increase the specificity of tetramer staining for strongly recognized ligands. At higher temperatures, it appears that the off-rate can be increased beyond the threshold at which the avidity of tetrameric forms of weakly recognized MHC ligands can compensate to allow the formation of stable complexes with cell surface TCRs. Moderate changes in peptide sequence may allow sufficient interaction at low temperature for formation of stable complexes with cell surface TCR when tetramerized but fall outside the kinetic window for activation. This appears to be the case for the SLH variant with the 868 CTL (Fig. 3⇑). Consequently, the use of tetramers to stain CTLs within PBL samples at a low temperature may result in background staining due to the binding of tetramers to TCRs that only recognize the peptide-MHC very weakly. This may result in an overestimation of the frequency of functional Ag-specific CTLs, especially when tetramer-low cells are counted as tetramer-positive. Importantly, however, we have no evidence that CTLs will bind tetramers incorporating completely unrelated peptides, even at 4°C. All clones and polyclonal lines reported here showed no background staining with tetramers based around any other epitope, confirming that tetramers demonstrate a high specificity for CTLs recognizing their peptide-MHC class I complex. Although the cross-reactivity of tetramers at 4°C probably relates to only fine differences in CTL specificity for highly similar epitopes, the effects of this phenomenon on tetramer-generated data may be potentially important. The possibility of cross-staining with tetramers is of most concern with pathogens of variable antigenicity such as HIV-1 or hepatitis C virus (26). The phenomenon of original antigenic sin or epitope imprinting, whereby the exposure to an Ag influences subsequent responses to similar Ags, was recently extended to CTL epitopes (35). This study showed that mice primed with lymphocyte choriomeningitis virus respond to a subsequent infection by lymphocyte choriomeningitis virus containing CTL epitope variants with a CTL response directed against the initial epitope rather than against the new variant. Maintenance of an initial CTL response in the face of a poorly recognized variant CTL epitope could severely compromise the effectiveness of the overall CTL response. It was noted that pathogens of variable antigenicity may exploit this phenomenon (35). The incubation of tetramers at both 4°C and 37°C may allow distinction between CTLs that recognize variant epitopes to different degrees and may prove to be a useful tool for tracking CTL responses as epitopes mutate. Cross-reactive staining may be problematic in other systems. When Yee et al. (19) used tetramer incubations at 4°C to study CTLs specific for the melanoma Ag Melan-A, tetramer-low CTLs lysed peptide-pulsed cells but had insufficient avidity to lyse tumor cells. Substitution of a brief 37°C incubation for a longer 4°C incubation reduces the detection of this potentially nontumoricidal tetramer-low population relative to the highly lytic tetramer-high population (data not shown). Such effects may be particularly important for this HLA-A2.1-restricted Melan-A26–35 epitope, where CTLs specific for epitopes from a number of common viruses may cross-react with the Melan-A peptide (36). Given the huge array of nonself peptides to which the human immune system must be exposed, such epitope mimicry may not be an uncommon phenomenon. Although staining at 4°C may not be problematic in many systems, our results suggest that cross-reactive tetramer staining of CTLs specific for other epitopes that may closely mimic the epitope of interest will be lower at 37°C. If performing low temperature staining, inclusion of a high temperature control and confirmation of Ag specificity after cell sorting (5, 6, 17) are recommended. Exploitation of our findings to isolate both high- and low-avidity CTLs may prove useful to some researchers. In addition to improvements in specificity, we have demonstrated that staining at 37°C consistently produces higher intensity staining of both clones ( Figs. 1–2⇑⇑) and Ag-specific CTLs within polyclonal populations, and allows clearer separation of these cells from tetramer-negative cells (data not shown). Interestingly, our findings of tetramer internalization at 37°C suggest an important new therapeutic possibility. Because tetramers show such fine specificity for high-avidity CTLs at 37°C, multimerized peptide-MHC class I complexes may make highly specific probes for targeting CTLs in vivo. Internalization of these probes might allow toxins to be carried to the intracellular compartments of CTLs with very high specificity. In particular, toxins such as saporin (37), which are biologically active only when internalized through receptor-mediated internalization, might be conjugated onto multimerized peptide-MHC class I complexes or similar structures to allow specific immunolysis of CTLs involved in pathology such as autoimmune diseases. Our results may be broadly relevant to all studies using peptide-MHC class I tetrameric complexes to quantify CTLs ex vivo. If the interaction between peptide-MHC class II and the TCR is also influenced by temperature, then similar considerations will likely apply to the use of tetramer technology in MHC class II-restricted systems (38, 39). We thank Bent Jakobsen and Simon Davis for helpful discussions, Fiona Flavin and Ji-Li Chen for technical assistance, and Chris O’Callaghan for supplying BirA enzyme and for technical advice. ↵1 J.A.W., D.A.P., M.A.P., F.L., G.G., R.E.P., and A.K.S. were supported by the Wellcome Trust of Great Britain. P.R.D. is supported by the Cancer Research Campaign. G.S.O. and V.C. are supported by the Medical Research Council. The Ludwig Institute of Cancer Research provided support for some consumable reagents. ↵2 J.A.W. and P.R.D. contributed equally to this work. 4 Abbreviations used in this paper: APL, altered peptide ligand; IMP, influenza matrix protein.